James Brady, Gun Control Campaigner And Presidential Spokesman, Dies : The Two-Way Brady became a prominent gun control advocate after being struck by a bullet during the 1981 assassination attempt on President Ronald Reagan. He was 73. Brady visited the James S. Brady Press Briefing Room at the White House in 2011, on the 30th anniversary of the assassination attempt on President Ronald Reagan. 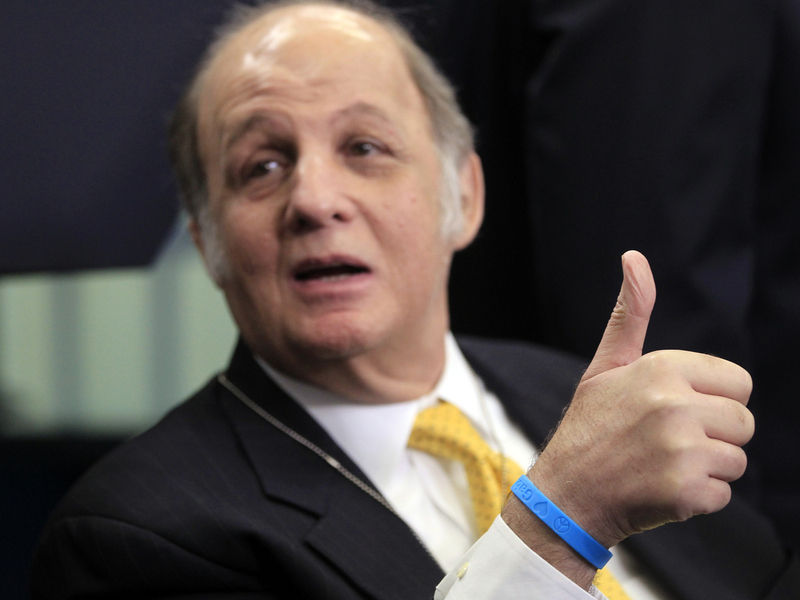 James Brady, a former White House press secretary and gun control advocate, died Monday, his family announced. He was 73. Brady served as spokesman for President Ronald Reagan. He was struck in the head by a bullet intended for the president during an assassination attempt in 1981. Asked by NPR's Scott Simon in 2011 how often he thinks about that day, Brady said: "As little as possible. I've worked very hard at forgetting as much about that as I possibly can. But I've not been able to do it." The 1993 law mandating federal background checks for handgun purchases was named for Brady. The White House press briefing room was named in his honor in 2000. "Jim set the model and standard for the rest of us to follow," Josh Earnest, President Obama's press secretary, and 11 of his predecessors said in a joint statement. "It's been a genuine honor for each of us to stand at the podium in the briefing room that will always bear his name." Brady's wife, Sarah, took up the cause of gun control in earnest after their young son picked up a loaded handgun in the car of an acquaintance. She became chairwoman of Handgun Control Inc. in 1989 and of the Center to Prevent Handgun Violence two years later. The two organizations have since been renamed the Brady Campaign to Prevent Gun Violence and the Brady Center to Prevent Gun Violence. "When my brother suffered a traumatic brain injury after a shooting at the Empire State Building, Jim and Sarah demonstrated that it was possible to turn a terrible tragedy into real change, and were a big part of the reason I chose to dedicate my own life to preventing gun violence," Dan Gross, the Brady Campaign's president, said in a statement. James Brady began his career in public service as an aide to Sen. Everett Dirksen, a Republican who represented his home state of Illinois. He worked in advertising and public relations back home, but moved to Washington in 1973 and held numerous positions in congressional offices and executive branches. Brady served as the spokesman for Reagan's transition team, but his career as the White House press secretary was cut short by the shooting. He used a wheelchair for the rest of his life and his speech was affected by his injuries. The Bradys found common cause with Democrats on the gun issue, serving as opening night speakers at the party's convention in 1996. "Since 1993, the law that bears Jim's name has kept guns out of the hands of dangerous individuals," Obama said in a statement. "An untold number of people are alive today who otherwise wouldn't be, thanks to Jim."